Echoing in my mind as I awoke a few days ago were the words made famous by Martin Luther King, “I had a dream;” and for the night that had just transpired, that was one of the biggest understatements imaginable. It had been an amazing experience as one dream segment flowed into another, and then another—waking often for a brief moment, only to quickly fall back to sleep for a continuation of the sequence. When morning finally arrived I knew I needed to write as much of it down as possible, but already the scenes were quickly fading. What remained was the sure and certain knowledge that I had just witnessed the glory of the LORD being released among His people in a way that we perhaps have never seen since the first Pentecost; since that day when Jesus’ followers who had obediently waited for the coming of the Holy Spirit finally received Him. Failing to recall all of the specifics, yet still reeling from the weighty presence of God throughout the night, I wrote the little that I could recall in my journal; and yet I knew that in one of my waking moments a familiar song had been resounding in my spirit, a song I knew I wouldn’t forget; but I did. So I asked the LORD to remind me if it was important and, to be quite honest, I didn’t really expect Him to do it. But i immediately remembered the Gaither’s incredible song, The Church Triumphant. Please, please visit https://www.youtube.com/watch?v=WtCV_ysZC04 to listen and be blessed by the song, and join with me to rejoice that God’s Church is indeed alive and well. In recent times, many of us have focused much attention on terrible circumstances—the terrible state of the world, the terrible state of the economy, the terrible state of our families or relationships, the terrible state of the modern-day church that has so compromised itself with the world. And indeed, the terrible truth of Romans 2:18-34 is everywhere we look. Remember those faithful disciples who went into that upper room and waited for the coming of the Spirit? Many of us have much in common with them! We have been waiting for a fresh outpouring of the Holy Spirit for years and years and years. We have waited and waited, standing in faith on the promises of God. What if our wait is just about over? I absolutely believe it is! I’ve have held onto that promise for such a long time it seems; but now, after that night of glory-filled dreams in which the church was exploding for righteousness at every turn, I’m certain that the Church, God’s Church, is very definitely alive and well; and the triumphant power of Jesus through the presence of the Holy Spirit is even now being poured out upon the world. Let this day of Pentecost be a day that history will look back at as the turning point, as the day when the Holy Spirit began to blow anew throughout creation to revolutionize the Bride of Christ as she prepares for the arrival of her Bridegroom. Calvin, I agree that the photo is truly amazing! It was sent to me by an unremembered person and may have been from a news source during a recent series of bad So CA fires. 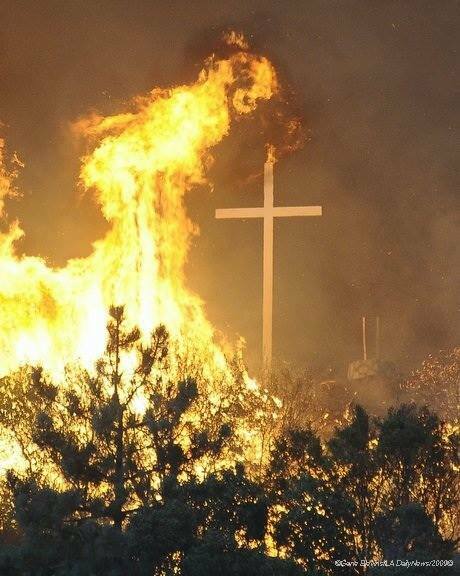 It’s the first of a series of 3 pictures–in the second, the fire appears to have engulfed half of the cross; and in the third, the fire is out, the cross remains standing, and is viewed through the remains of the burnt bushes in front of it. And yes, His glory is here! I can feel Him all around–a tangible, physical sensation of His powerful presence. Correction: typo, Rtrd should be. Raising the dead. Sorry for the goof. Your photo is absolutely astounding. It must have been created in the glory of God. I am looking for more people to see the glory of God manifest as fulfillment to Hab 2:14. I am just beginning to see the awe of the glory of God, not just to see supernatural events in the heavens etc., but in the changes in lives, healing, Rtrd etc. it appears that you have already your entry into wearing the mantle of the glory of God.